We value our patients' experience at Worthington Family Chiropractic. If you are currently a patient, please feel free to complete the following Client Experience Questionnaire. The Questionnaire is in Adobe Acrobat format, and requires the free Acrobat Reader to view. The NUCCA technique worked for me! Hi, my name is Paul Mitchell. Let me tell you my brief story, and why I am a NUCCA believer now. For the past 7 years, I have been living with slight neck pain, right shoulder pain and right arm pain and numbness at times. I had sleeping problems if my neck wasn't propped up by two pillows, and sitting & driving problems if in the car for more than an hour. I had an MRI back in 2007, that showed a bulging disc between my C5 and C6 vertebrae. In 2007, I was then treated with some physical therapy by my family physician which seemed to remove the constant pain, but my neck would get fatigued generally late in the day, and I would have to straighten my neck, by cracking it, to relieve the pain. I was constantly looking for the best pillow to sleep with, so that I could get a good night sleep, because if my neck was in its normal position, it would pinch on the nerve, so I had to sleep with my head propped up abnormally to sleep. I knew surgery was an extreme last resort, by just talking to the young physical therapist who worked on me in 2007, from his experience seeing patients long after surgery. I thought I was lucky to get most relief, and thought I would have to live like this for the rest of my life. Boy was I mistaken. A good friend of mine, told me about her Chiropractic Doctor. And how her doctor had a special technique and procedure. Believe me, I was skeptical!!! I had been to a chiropractor before, and I couldn't see how their SNAP, CRACKLE, POP procedure was going to help me. But out of respect for my friend, I told her I would go hear what her Chiropractor had to say. I figured, that I owed it to myself, to see, but I thought I was living as best I could with my present situation and generally my neck didn't hurt unless I was in certain postures. She took me to see Dr. Danielle Rice. After the initial assessment, and treatment procedure, I was very skeptical. All these visits??? All this money??? Why I thought??? I sure wasn't a believer at first. I asked numerous questions, watched her video, and some things started to make sense. When I saw on the X-Ray that my first vertebrae was way off center, that got me thinking??? But I still didn't understand how that was going to fix my C5 - C6 problem. After 3 months of adjustments, I still had pain and numbness when my head would be in a normal position. I thought to myself, I don't think Dr. Rice is understanding me, cause she told me that I couldn't continue to sleep with two pillows, that I had to let my neck go back into its proper position. I thought she was a little crazy…. How could I sleep with my head in its normal position? That will just bring back the pain and numbness. I made almost every appointment as set forth ahead of time in her assessment plan. We just followed her original treatment plan. It took about 5 months in total time, but guess what… She was CORRECT!!! It did take time for my neck to heal itself after her continual care of returning my neck to its proper place with the soft and easy NUCCA technique. I never could of imagined that I would be able to live like this!!! I was under the impression, that, I just had to live with my buldging disc. But guess what, the Body is an amazing thing… and so is Dr. Rice!!!! Also, I believe if I would have done the exercises more frequently, it probably would have even happened sooner. I can sleep now, with a normal pillow. I can even sleep on my sides. I can sit and lay on the couch without pain. Well Dr. Rice is only one of two NUCCA doctors in central Ohio…. And I sure believe that, the NUCCA technique should be used by more chiropractors. You owe it to yourself to get your head on straight, so to speak…, so your back can do its job correctly, and not put excessive stress on the rest of your spine. PS. I wonder what percentage of all back problems stem from inappropriate upper vertebrae problems? 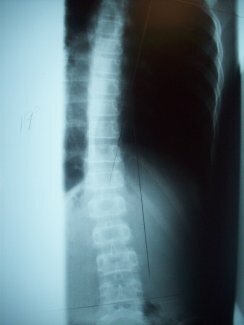 A 10 year-old suffering from a 19 degree curvature of the spine. 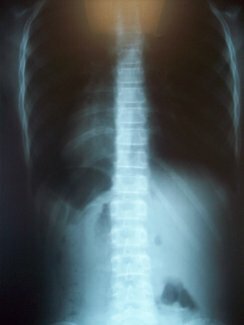 Our 10 year-old daughter went to her grandmother's chiropractic appointment in October, where a by-chance scoliosis check and subsequent X-ray revealed and confirmed a 19-degree "C" curvature in my daughter's spine. A curve greater than 10 degrees is considered scoliosis. We learned that children are "braced" with curves greater than 25 degrees. This chiropractor proposed a treatment plan utilizing traditional chiropractic techniques. Additionally, a heel lift was suggested since one of our daughter's legs was "longer than the other." Since I had been under Dr. Danielle Rice's NUCCA care for 3+ years, my husband and I brought her to Worthington Family Chiropractic for a second opinion. Here, the diagnosis was confirmed and an alternative treatment plan proposed. We were advised that thankfully the curve was detected early (pre-puberty), and that there was time to correct the curve before the bones set in place. We opted for the NUCCA treatment because we felt it would be a more gentle treatment than the "popping and cracking" manipulation of traditional chiropractors. We also scheduled an appointment with her pediatrician, who reviewed the first X-ray and ordered a new X-ray for a potential referral to an orthopedic physician. The pediatrician advised us to wait and watch to see how the bones would adjust. He was not supportive of our decision to treat with chiropractic. We had the X-ray done just to make sure that there was not spina bifada. (There wasn't). Rather than "wait and see," we decided to continue with the chiropractic treatment given the chance to correct the curve before the bones set in place and to avoid potential bracing if at all possible. We followed Dr. Rice's NUCCA treatment plan and exercises for three months. 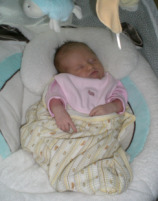 The results were detectable almost immediately as our daughter's posture was visibly improved. Previously, her left shoulder drooped, and now her shoulders were squared. The "short leg" became even with the other leg. After three months, a subsequent X-ray was taken and compared to the initial X-ray. The results were remarkable- her 19-degree curve was now less than 2 degrees. The scoliosis was corrected! 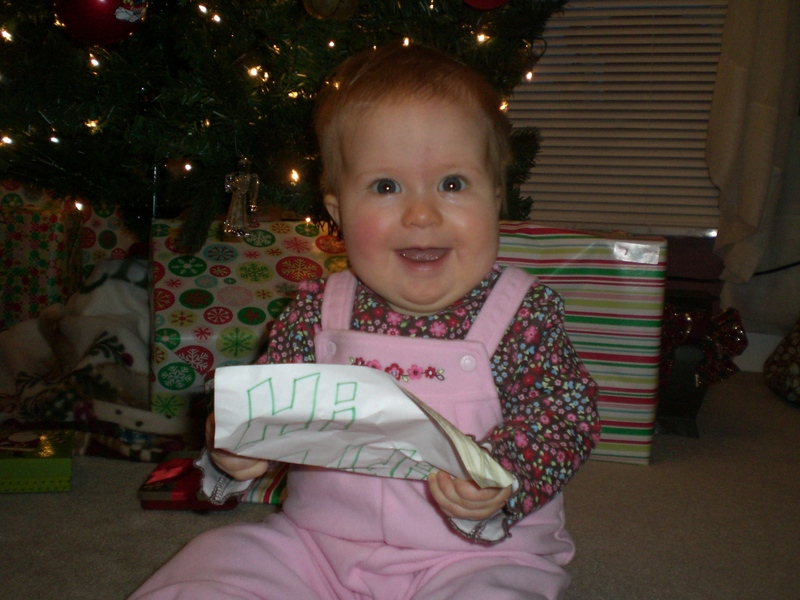 We are grateful that our daughter's curve was detected early, and that the NUCCA approach proved successful. We continue to take her to see Dr. Rice once or twice a month to make sure she is holding her alignment. While we would have been willing to try the traditional chiropractic treatment plan, we are grateful that Dr. Rice's more gentle NUCCA technique was an available option. We are extremely happy with the results, and would recommend an evaluation to others facing a similar diagnosis. For the past 15 years, headaches have simply been a way of life. On a weekly basis, I'd average 2-3 mild headaches and at least one pretty bad one. Then a nasty migraine at least once a month. As bad as that sounds, I never really gave it much thought because as far as I knew, that was normal; at least for me. Other doctors simply prescribed Imitrex and suggested I get more rest. After some coaxing by the wife and family, I started seeing Dr. Rice. I noticed immediate improvements. My daily and weekly headaches were completely gone. And in the past 4 months of receiving NUCCA treatments, I've only had one minor migraine (well as minor as they can be.) Guess a better way of saying it is that I've only taken an Imitrex once since I started NUCCA. Looking back, one of the worst parts of frequent headaches was waking up in the middle of the night with one. I always joked, 'How stressed can I be? I'm sleeping!'. Well, I fully believe that having proper alignment and learning the proper way to lie while sleeping has made all the difference. I've not woken up one single time from a headache since I started seeing Dr. Rice. Add the fact that I'm not popping Excedrin like Skittles anymore, and life is good. I can't thank Dr. Rice enough for all she's done to educate me and keep my spine in shape. It's been a life changing experience. 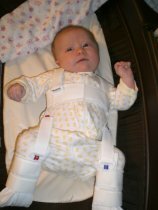 Our daughter, Lauren, was born with Torticollis (a twisted neck in which the head is tipped to one side, while the chin is turned to the other) and Hip Dysplasia (an abnormal formation of the hip joint in which the ball at the top of the thighbone femoral head) is not stable in the socket). She was put in a Pevlic harness for one month in order to help correct her hips, which worked very well. However, in order for her neck to straighten out and become stronger the doctors wanted her to go through physical therapy. My husband and I had been receiving N.U.C.C.A. chiropractic care for a couple of years, and believed that this would be beneficial for Lauren as well rather than just physical therapy. from Dr. Rice and Barb. We have seen great results in Lauren's posture and health in general. Conventional treatments were unreliable and I often suffered side effects from drugs and still had the migraine! My migraines have improved dramatically since beginning NUCCA. I now don't have to take time off work or miss social events. Patience was needed initially and it had really paid off. My new normal is pain free and if I do get a headache, an adjustment usually relieves the pain within a few hours. No drugs needed! Trying NUCCA with Dr. Rice is the best thing I have done for my health. I have noticed other benefits in addition to migraine and neck pain relief. Dr. Danielle Rice and Barb are positive, caring and very special people. Words cannot fully express my gratitude. I was involved in a car accident in 1969- received whiplash and then forced to have surgery for a disc fusion. This helped my problem at the time. I had severe pain up the left side of my head and out through my eye and could not hold anything heavy in my left hand. For years and until I found Dr. Rice I was always in itching agony in both my arms, especially my upper arm and in front of my shoulder. I had been seeing a skin specialist for getting steroid shots and using topical creams. This was only a temporary fix. My itching always was worse in the late summer and bad in the fall and winter. I read and researched for a cure for this itching. One of the things I read about was nerve damage causing arm itching. 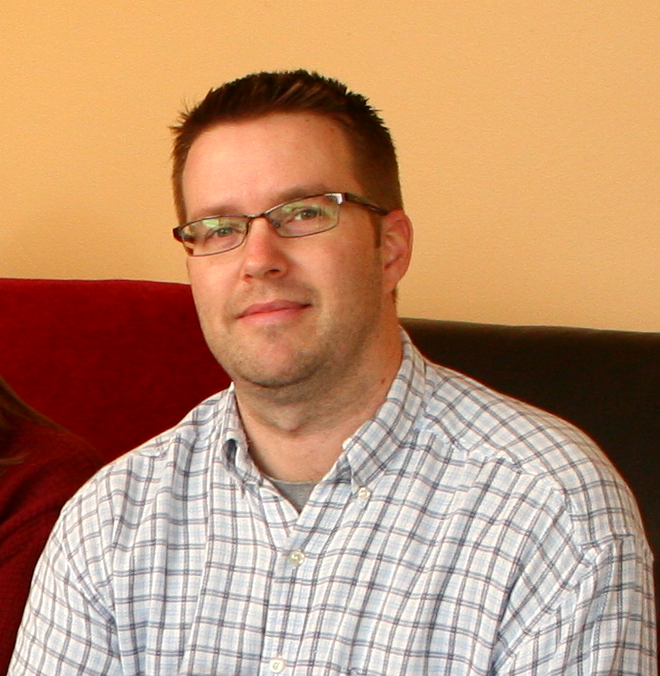 I started chiropractic treatments: this was a miracle cure for my itching. Receiving treatment with Dr. Rice on a routine schedule has kept me sane again. Thank you Dr. Rice. I feel so much better since going to N.U.C.C.A. My back has been pain free for about 4 months or more. My husband has seen a difference in me. I am able to garden and exercise without taking breaks every 20 to 30 minutes due to discomfort and aching back. My posture is even instead of leaning to one side. My energy level is up, and I feel younger. Yeah! Thank you Dr. Rice. 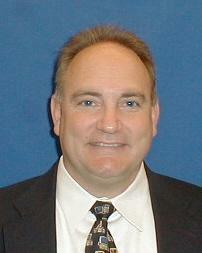 I am a competitive 50+ athlete and have had chiropractic care for approximately 15 years. Those treatments only provided temporary relief. I have had four weeks of NUCCA treatments and the daily sciatica is hardly noticeable. Most of the "popping" joint sounds are gone from my head to my toes. My daily workouts were frequently limited or altered due to the sciatica, but now are limited only by my energy level. My posture and range of motion for my head have also improved. My headaches are nearly extinct. I haven't had back discomfort or tossed and turned during the night lately. I no longer experience the numbness in my arm during physical activity and the tenderness in my neck is completely gone! I also noticed that my knees do not ache as much while climbing stairs. It's strange, but I actually feel as though I walk differently and that my gait is much steadier and without conscience effort when walking into work each morning. It's almost like my body has been over-hauled! The results were very gradual and I must admit to a few moments of doubt as to whether the NUCCA was really making a difference. However, after my 8th or 9th visit I felt a significant change in my body and I just woke up one morning feeling great! My energy level and attitude have improved too. I am so happy that I continued with the treatment, otherwise, I would still be experiencing physical discomfort and personal dissatisfaction over my body's limitation. Aside from the NUCCA treatment and care I am receiving, I can't say enough wonderful things about Dr. Danielle's approach to her patients and her ability to explain the process of the NUCCA treatments. It is also refreshing to be welcomed with a warm smile by everyone in the office. I know I gave you some challenges while I was doing my home projects and placing constant physical stresses upon myself during my initial visits…but you pulled me through it! Before going to Dr. Rice I have been experiencing low back pain for many years. It has been debilitating at times. I have gone to Chiropractors in the past and have been given a small amount of relief. Since going to Dr. Rice and receiving NUCCA adjustments, I have been pain free longer than any period of time in the last 30 years. Due to certain health issues, conventional Chiropractic methods were not an option. The NUCCA Chiropractic technique has changed my life. I am experiencing a lot less pain and discomfort, not to mention that I no longer use my walker or my cane when walking. I started care under Dr. Rice as a preventive measure to help maintain my health. To my amazement I am able to walk further distances without pain in my legs and hips. Now it feels good to know I can go shopping and do things I enjoy. We began chiropractic care in the year 2001. Our oldest son had reoccurring ear infections and was put on countless amounts of antibiotics. He was diagnosed with "Reflux" and was put on nebulizer treatments to help with his breathing. Needless to say, we were stressed to see this abundant amount of medication pumped into our newborn's system. Luckily, one day we were educated on a holistic approach known as "chiropractic care". We were told to try it. And thank goodness we did! At first we were a little leery about this approach. But once educated, we found that if the spine is aligned it's able to function more properly. In other words, it would prevent future ear infections or if he were to get one, the body would be able to work harder to fight off the infection in a quicker amount of time. We're happy to say that our oldest child hasn't experienced any more reoccurring ear infections, the "reflux" is no longer an issue and he is no longer on any breathing treatments since we've begun chiropractic care. We've now learned the importance of chiropractic care and are "believers" of this practice. Our second child is a healthy young man who hasn't experienced any of the problems our oldest child has. Our pediatrician supported our decision and said, "if you think chiropractic care is working, let's continue it". Our entire family gets adjusted on a consistent basis, sick or not sick, just to make sure our bodies are aligned and functioning properly. Furthermore, we watch our diet and take multi-vitamins. When we feel a cold coming on, instead of popping over the counter drugs, we pop the vitamin C pills and let it runs its course. However, I'm still working with my husband on this because he tends to sometimes reach for the Nyquil as a habit. People that aren't educated in chiropractic care, as we were, think it's solely for people who are in pain. This is true. However, once educated on this philosophy we now know it's also a preventative measure. It makes sense. Think of your body as a car. If you take the time to maintain it, oil changes, tire rotation, antifreeze, the likelihood of problems is none to few. Same with your body. Take the time to maintain it. If your spine is aligned, your body will function more properly saving you more money on doctor visits, over the counter and prescription medicines. Not to mention, the discomfort of being sick. Are you worth it? My family is and this is why we've chosen Dr. Danielle Rice and chiropractic care!